UEFA has moved Thursday’s Europa League soccer game in Ukraine between Arsenal and FC Vorskla to the capital city of Kiev after parliament voted to impose martial law in parts of the country. “It is something that can’t be accepted and Poland completely disagrees with such actions,” Duda said. He called for a de-escalation of the conflict and the release of the Ukrainian vessels and their crews. “If there are such international initiatives, like further sanctions (on Russia), Poland will support them, as we are ready to take every action to end this conflict,” Duda told the media after talks with his Bulgarian counterpart, Rumen Radev. After Moscow’s annexation of the Crimean Peninsula from Ukraine that year, Estonia, like its Baltic neighbors Latvia and Lithuania, fear that they and other former Soviet republics could be next. Russian Foreign Minister Sergey Lavrov is rejecting foreign mediation in Russia’s standoff with Ukraine over Ukrainian ships seized near Crimea. Lavrov said in Paris on Tuesday “I don’t see a need for any kind of mediators.” He spoke after Germany’s foreign minister suggested that Germany, France, Russia and Ukraine could work together to resolve the tensions. Lavrov reiterated Russia’s stance that Ukraine “intentionally provoked” Russian authorities by entering maritime space near Crimea, which Russia annexed in 2014. Russia seized three Ukrainian ships and detained the crew Sunday in the Kerch Strait. Ukraine says Russia had no right to stop the ships. Lavrov spoke after meeting with French Foreign Minister Jean-Yves Le Drian, who appeared to soften his criticism of Russia’s seizure. Ukraine’s foreign minister says his country has asked the Red Cross to arrange a visit to seamen taken prisoner by Russia. Ukrainian Foreign Minister Pavlo Klimkin told The Associated Press on Tuesday that he has spoken with the president of the International Committee of the Red Cross about visiting the Ukrainian prisoners and he’s waiting for a Russian response on whether it will be possible. “It’s not a political issue here, because we can have an argument about the legal status, but not it’s about simply concentrating on protecting them and helping them,” Klimkin told the AP. The Organization for Security and Co-operation in Europe is urging Russia and Ukraine to refrain from “any further provocations” and engage in dialogue to reduce tensions after the two countries’ standoff near Crimea. Germany’s foreign minister is suggesting that Germany, France, Russia and Ukraine could work together to resolve tensions between Moscow and Kiev following the weekend’s incident near Russian-annexed Crimea. Russia’s main intelligence agency has released a video of three crewmembers of the Ukrainian vessels that were seized on Sunday. Russian President Vladimir Putin has told the German chancellor that he is “seriously concerned” about the weekend’s escalation near Crimea and developments in Ukraine. 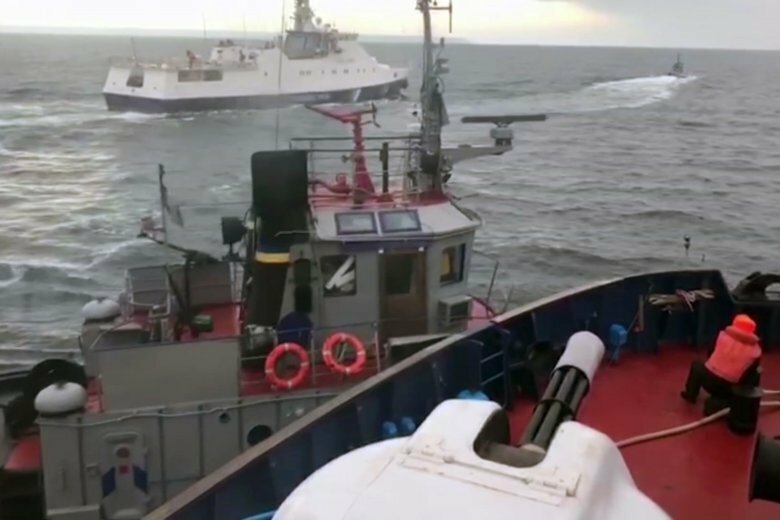 Russian border guards on Sunday opened fire on three Ukrainian navy vessels and eventually seized them and their crews. Ukraine on Monday announced martial law in parts of the country, citing a “growing threat” from Russia. Merkel’s spokesman, Steffen Seibert, said Merkel in the conversation with Putin stressed the need for de-escalation and dialogue.